Last Steam summer sale really ruined up my intention in scheduled writing for my site. 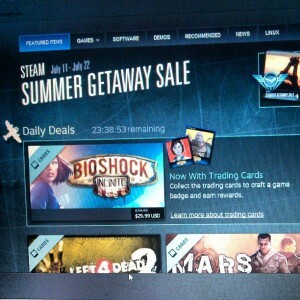 I bought a bunch of games but I think the summersale is not as awesome as last year summersale, there are a lot repeated game that are on daily flash etc. Nevertheless I bought a lot of them, and sadly after the sale is over… The Humble Bundle sale are on with an incredible game bundle, I bought it up immediately afterward. and again after that… and again after that. It adds up a bunch of games on my game backlog and I made a promise to myself that I shall finished every games that I just bought. It’s a been a success after that, finish 4 games and now I’m currently playing Retro City Rampage and Saint Row 3. Oh yeah I’ve also use Instagram and Path quite a lot now, I know I am late comer I am, but that’s because I didn’t get Instagram and Path at first; prefer FB or Twitter over it. Now with the FB android apps still looks like crap (Facebook Home can’t installed on my phone and tablet, both of them are dual core, so it’s not the spec that didn’t met) and I want to get a hang in street photography so I started to use instagram even more and Path for personal life. And yeah it’s true about Instagram that a lot of your pictures looks good on phone but looks like crap on HD (not all of them, most of them because shaky), but who cares, I can take pictures of what I think is awesome on the street and edit it right it away without a hassle.